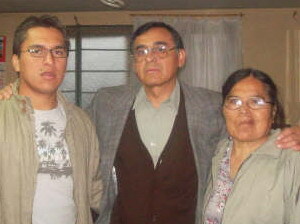 Udelia (r.) with Narciso and their son Eliezer. Starting last weekend and for three days of this week, we had a group working in door-to-door evangelism here in Cajamarca. The group arrived on June 21. It was three brothers from E3 Partners, from Alabama in the United States, and three translators from Lima. They worked with a “gospel cube.” It was interesting and brought an enormous benefit. Twenty persons made a decision to follow Christ—10 of them from just around our neighborhood. They offered eye glasses to people. First they would present the Gospel, using the cube, then they would fit them for glasses. Yesterday we went out with two brothers to visit those who made a decision. We found some at home, but we need to follow up with the rest this weekend. We had a discipleship meeting yesterday at 5:30 pm and 10 new people attended—a blessing. Now, I regret to inform that my wife’s health is very poor. Her kidney is shutting down and she is swollen and having trouble breathing. Right now she is in the hospital in Lima. She has been a very brave, valuable and wise woman in raising our children in the ways of the Lord; competent in the work of planting churches; loving in seeking the salvation of souls. When this group arrived, she cried because she couldn’t go out with us to evangelize. Her vision is poor and she trips and falls a lot. Please, I ask for your prayers. If God wants to take her, may it be without the pain of dialysis. If God wants to give her more life, may He give it to her. And when He does take her, let it be without further pain. I miss my wife, a valiant woman who has helped me so much with her words of encouragement. But time doesn’t stand still, everything comes to an end. Please, pray. 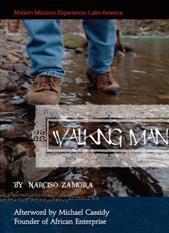 Esta entrada fue publicada el junio 28, 2013 por Walking Man. Se archivó dentro de Uncategorized .